The poppy series began with a painting created for a web based competition – ‘Seeking Picasso’ in which I was a finalist. 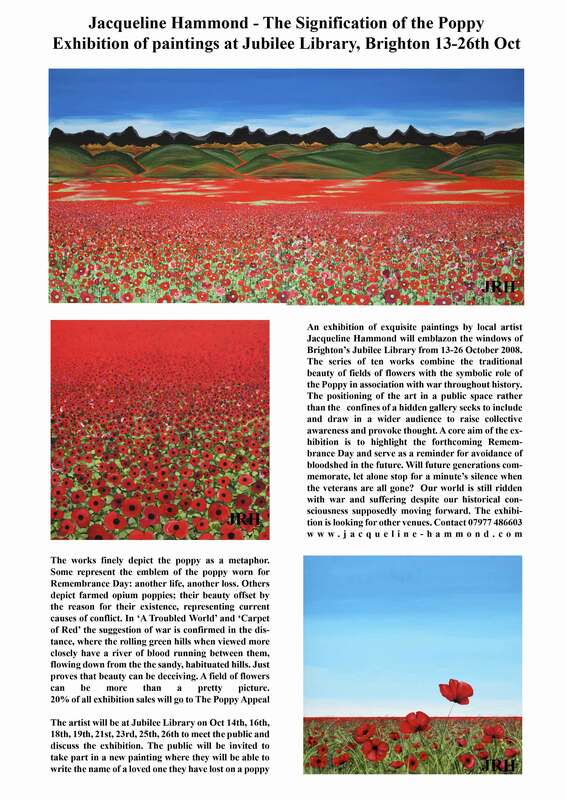 The theme was ‘A Troubled World’ and so the painting was inspired by the situation in Afghanistan and the general metaphor of the poppy in relation to war. I was then commissioned by one of the judges to produce a series of paintings on the same subject for The McNeill Gallery, Radlett, Hertfordshire. The Signification of the Poppy became an exhibition of paintings first shown at Brighton’s Jubilee Library in 2008. If you love poppies you’ll love this series of paintings depicting the traditional landscape of poppy fields but with a contemporary edge, combine the beauty of flowers with the symbolic role of the poppy in association with war throughout history. As well as being a topical subject, the positioning of the art in a public space (Brighton’s Jubilee Library) rather than the confines of a hidden gallery seeks to include and draw in a wider audience to raise collective awareness and provoke thought. For 70 years the men who fought in the First World War were largely forgotten. It was not their heroism that became the predominant memory of that war but the waste of so many lives. Of the millions of British servicemen who fought in the First World War none of them remain to witness Remembrance Day today. Depicting the poppy as a metaphor; some represent the emblem of poppy worn for Remembrance Day: another life, another loss. Others depict farmed opium poppies; their beauty offset by the reason for their existence, representing current causes of conflict. In ‘A Troubled World’ and ‘Carpet of Red’ the suggestion of war is confirmed in the distance, where the rolling green hills when viewed more closely have a river of blood running between them, flowing down from the bloodshed in the barren, sandy, habituated hills. Just proves that beauty can be deceiving. A field of flowers can be more than a pretty picture. There’s plenty more to share about this art and the story behind the series, from brain storming ideas, drawing mind maps, the preliminary sketches clarifying the concept. Signification of the Poppy began as a Seeking Picasso competition winning entry and led to gallery representation and interest from the media, National museums, charities and organisations such as the British Legion and RNLI. This collection lists the paintings in the series created for exhibition. The collection also aims to include lesser known pieces as well as artwork created at different stages involved in the working process of the artist. The full catalogue of works includes several unseen works and original sketch paintings, as well as the final art works on canvas. See the full series of artworks on my website.